You’re probably wondering how a dude can stay trapped in a bathroom stall for an hour and a half with zombies filling the bathroom. Watch this film and you’ll see how! Stalled is a British Christmas zombedy goodie! It all begins with a maintenance man working in the ladies room of an office building during a Christmas party. When he discovers a dead rat in the ceiling, you can’t help but wonder if the rat is what causes the outbreak. But don’t expect an answer. 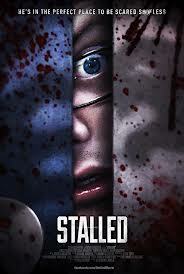 Stalled isn’t about how the zombies are made; it’s strictly about how a dude stuck in a bathroom with zombies survives. Our maintenance man hides in a stall when two hot chicks in Santa’s helper outfits (bikinis) come into the bathroom and start getting all horny for each other. Suddenly, the lesbian love bites get serious. And so begins the zombie insanity! Stalled manages to bring some fresh and unique ideas to the zombie genre, from zombies being distracted by reflections and used tampons. I know. Ew. Our bumbling maintenance man is the perfect comic foil to the zombies and there are just enough humans around to feed the zombies and our thirst for gore, including muscular hot Jeff the IT guy, who makes the stomachs of both humans and zombies growl. While we don’t get to see the office Christmas party, a zombie Santa and a zombie Jesus do stroll in to the bathroom, and the classic Band-Aid track “Do They Know It’s Christmas?” is even used in one scene! There’s also a drug trip scene in which the maintenance man body surfs the zombies and breaks into a Thriller-esque dance number with them. And believe it or not, if he gets out of the stall alive, he may even find a little Christmas romance…. Stalled is sure to be a zombedy classic if it gets the attention it deserves. It became an immediate fave of mine. This entry was posted in Movie Times & Television Schedules - Staying Entertained, The Evil of the Thriller - Everything Horror and tagged living dead, Stalled, undead, zombedy, Zombies, zomcom. Bookmark the permalink.